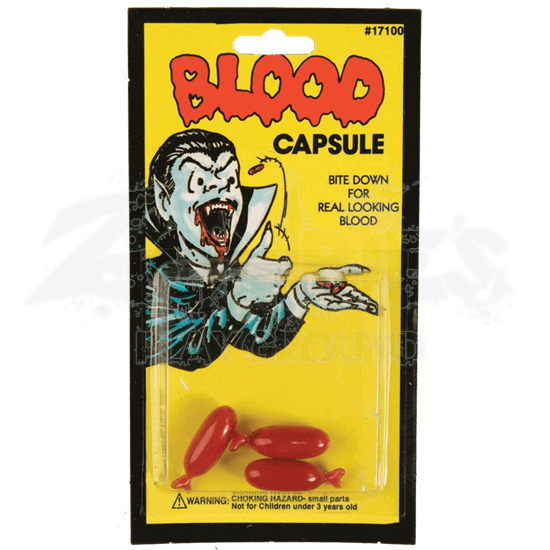 These Blood Capsules are the perfect touch of real blood color that any gory zombie costume or survivor look will need when the zombie apocalypse hits! Each capsule is filled with harmless red coloring that looks just like real blood. Each pack includes 3 blood capsules, which is enough for one person to add a few touches of blood in key areas to enhance their ghoulish and gory look. The capsules are easy to use. You just place them in your mouth and bite down, allowing the red coloring to mix and dribble out of your mouth like real blood. Or you can open them outside of your mouth and smear blood across your skin and clothing for a truly frightening effect! Survivors, zombies, and other monstrosities alike will all find uses for these Blood Capsules!